I don't want to give the final, damning word on Battlefield: Hardline yet. We haven't had a chance to touch or even take an extended look at the singleplayer campaign, and considering it's done by Visceral (of Dead Space fame) I'm holding out hope there's something redeeming. 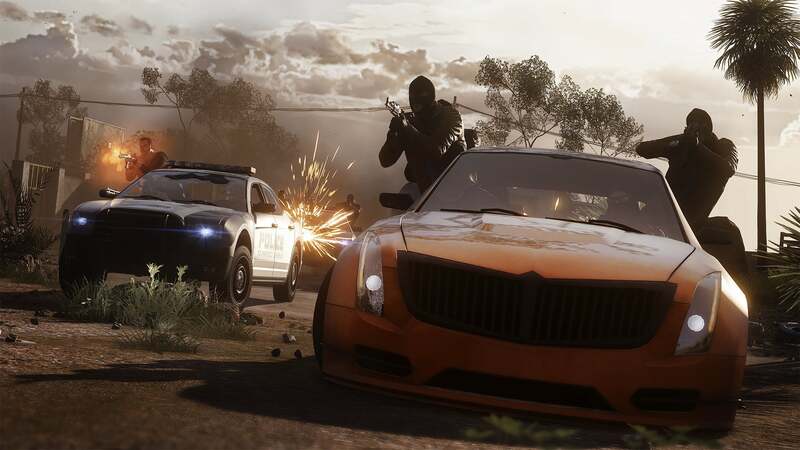 What we do have access to is this week's Battlefield: Hardline multiplayer beta. I'm not super impressed so far. 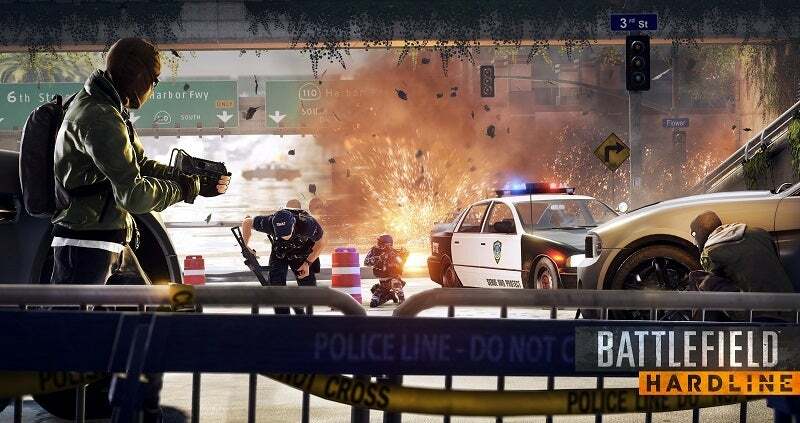 Battlefield: Hardline feels like Battlefield 4. Full stop. Forget everything they've said about delaying Hardline to make it feel more like cops and robbers or whatever. This isn't Payday. This isn'tSWAT or Rainbow Six or any other police game I've ever played. It is, quite simply, Battlefield. 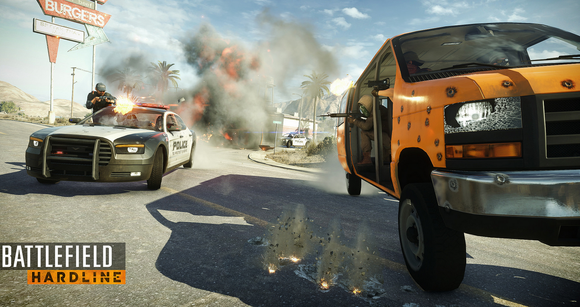 At any given moment you could most likely take a screenshot of Hardline and tell someone it was of Battlefield 4. It wouldn't take much convincing. The single map I've played (over and over and over again) is given some thin police-action context—"We're raiding a meth compound! "—and then it turns into any other Battlefield game. Military-style weapons. Grenades. Hell, attack choppers firing chain guns. I'm not going to claim that Battlefield is a particularly realistic series. It's not. We've got Arma and Red Orchestra for that. But my typical suspension of disbelief is suspension-bridge-sized at this point. To make a comparison that some percentage of you might understand: Battlefield: Hardline multiplayer is more like standard Battlefield than DayZ is like Arma. And DayZ didn't even start as a standalone game! It was an Arma mod. 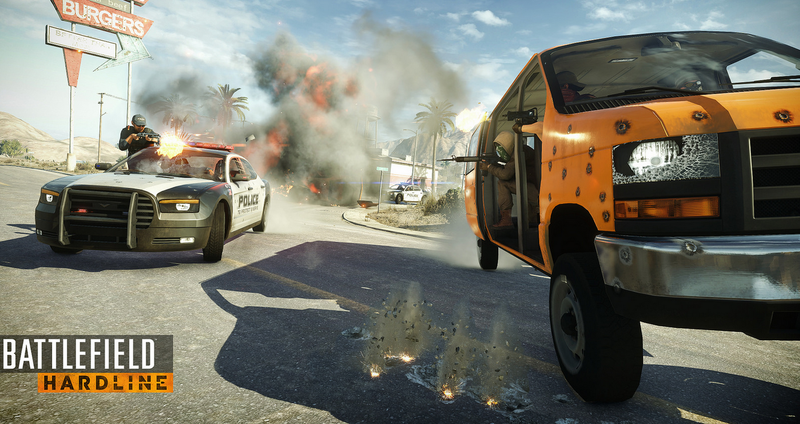 Battlefield: Hardline's Hotwire mode vehicular objectives are a welcome change of pace. Again, this is just multiplayer and there's a chance that Hardline's campaign is a rollicking good time. What we have here though is pretty thin. The entire time I was playing I just felt like I'd rather shut off the beta, boot up Battlefield 4 (with its boatload of existing multiplayer content), and play that instead. The one piece that holds any interest is Hotwire mode. It's similar to Titan mode from Battlefield: 2142—or, for more recent fans, Battlefield 4's Naval Strike expansion with its Carrier Assault mode—in that all the objectives are mobile. In Titan/Carrier Assault, "mobile" was a bit of a stretch, considering the Titan or aircraft carrier in question moved with all the grace of a beached whale. Hotwire mode is a bit faster-paced. Here, your objectives are cars. Capturing an objective requires stealing a car and driving it around at high speeds, racking up points the longer you drive. It's an interesting idea, even if it doesn't really make any logical sense. The main problem is the car physics. Or lack thereof. I've always thought Battlefield's vehicle handling was pretty decent, if a bit floaty, but cars in Hardline have no weight at all. Think of the worst Jeep-like vehicle in Battlefield and then imagine driving it on ice. On the plus side, motorcycles are incredibly fun to drive for the ten seconds before you get shot off them. Also, the cars play some great music. Another thing I noticed: There are multiple classes that seemingly focus on shotguns and close-quarters combat, but the only map I've played is the aforementioned gigantic meth compound with tons of wide-open space, rendering those shotguns pretty useless. In fact, things have gone the opposite direction, with at least half the players in any given match I played using sniper rifles. Part of me assumes there must be more close-quarters maps in the full game, but it would be impossible to play Hotwire without wide-open spaces so... I'm torn. Lastly, there's movement. It's funny that only a year ago every game played like a modern military shooter, with its slavish devotion to realism. Now, after a year of Titanfall, Evolve, Dying Light, and COD: Advanced Warfare I'm finding that running like a normal human being is, well, boring. Obviously it wouldn't make sense to include something like wall-running in Hardline, but I did miss how mobile I am in other games—not just because it's fun to jump willy-nilly across rooftops but because it opens up more tactical options. In something like Dying Light a staircase is nothing but a suggestion. In Hardline, it can become a hard chokepoint. It's impossible (or at least irresponsible) to divorce games from a larger context, and the context when it comes to America's increasingly militarized police force? Not so great, the past few months. 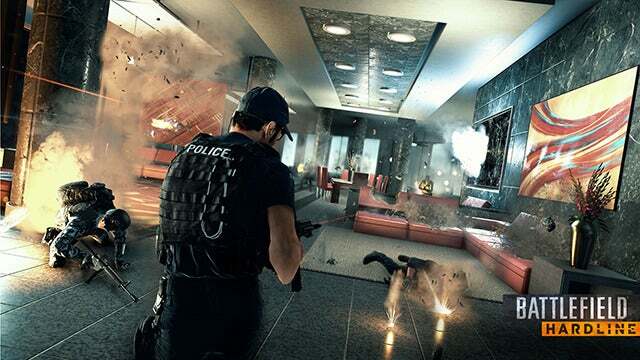 Battlefield: Hardline 's multiplayer doesn't feel like a police game or even a police movie. It feels like a military game where the soldiers forgot their uniforms and helmets, found a cache of surplus "POLICE" jackets, shrugged, and put them on. So I could almost forget I was playing a police game and put it all behind me and pretend it's not really an issue, but there are still some gross aspects—like when you murder some criminal and bark out "SUSPECT DOWN!" Or beating a guy with a police baton until he dies. It feels weird. And ultimately it's a bit interesting it feels weird. Apparently killing police is okay—not just in Hardline but in Grand Theft Auto and Payday, et cetera—but killing criminals as police seems wrong to me. Oh well. Personal preference. And again, this is just one aspect (multiplayer) of what's eventually going to be a full package. I'm still holding out hope for a fun, cinematic buddy cop singleplayer campaign from Visceral. Multiplayer, though? At the moment I'd rather stick to Battlefield 4. 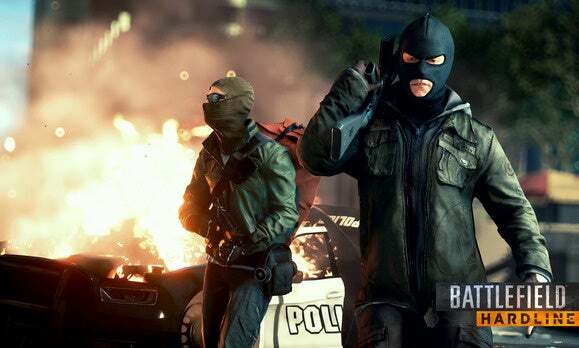 We'll have more to say about Battlefield: Hardline in March when the game releases in full.